Above: P&O Cruises' Oceana departing the Gibraltar cruise port. Above: Gibraltar harbor. The cruise ship facility is at the upper right corner of the city. 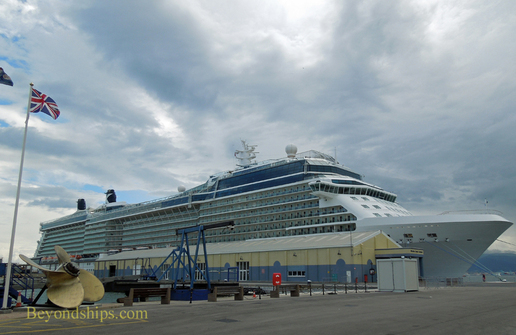 Above: Celebrity Eclipse docked by the Gibraltar cruise terminal. Below left: Anthem of the Seas in Gibraltar. Despite its small size, Gibraltar is a busy port. In fact, it is the fourth busiest cruise port in the Iberian peninsula after Barcelona, Malaga and Lisbon. 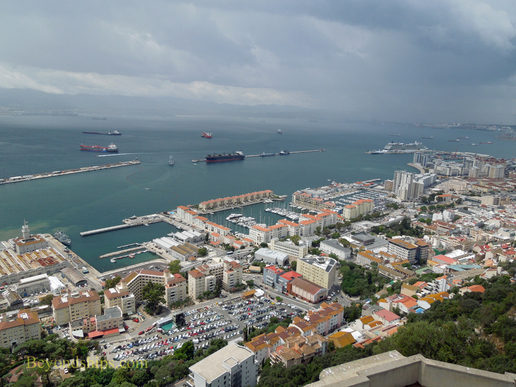 186 cruise ship visits are expected in 2013 bringing more than 300,000 passengers to Gibraltar. Cruise ships generally dock at the northern end of the port. Consequently, the ship will take you past almost all of the town as well as the length of the Rock before you dock. 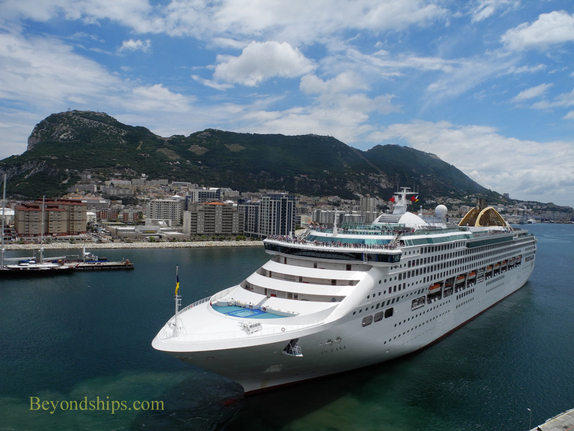 The cruise ship dock is at the end of a mole that projects out into the Bay of Gibraltar. Ships can dock on either side of the dock. According to the Gibraltar Port Authority, the dock can handle two large cruise ships or four medium size cruise ships at the same time. 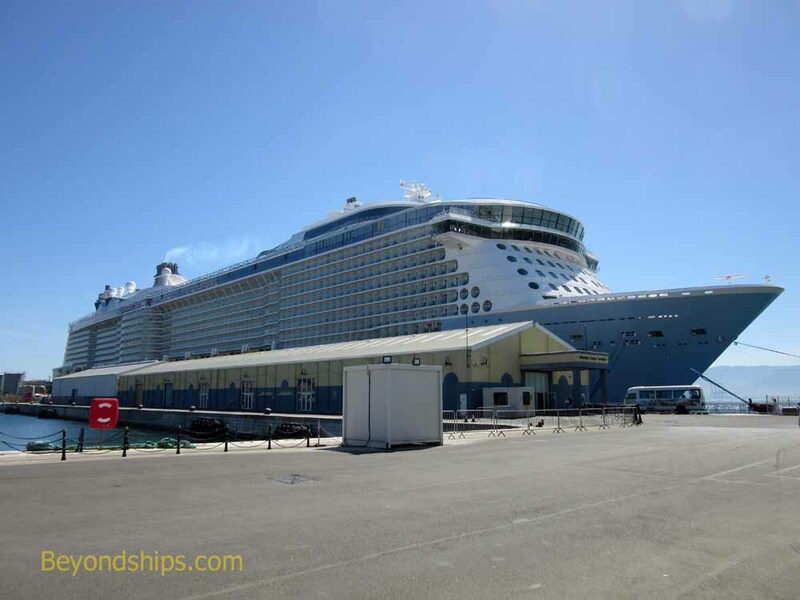 (If additional berths are needed, it is possible for cruise ships to dock at other locations around the harbor). On the dock is the cruise terminal building. This structure was originally a warehouse but in 1997 it was gutted and with extensive renovation, converted into a cruise facility. Inside there is a Tourist Board office, a cafe,a bureau de change, restrooms and some shops. The cruise facility is a short walk (10 minutes; less than one mile) to the center of the town. Alternatively, the port offers a shuttle bus (for a fee) into town. Taxis wait for passengers on the street just outside of the cruise facility.